Advocacy groups have released statements questioning the association of beverage giant Coca-Cola with the Olympic Games. The beverage-maker is an exclusive sponsor of the Olympics Games 2016, to be held in Brazil’s Rio De Janeiro, and plans a global advertising campaign during the event. The Coca-Cola Company’s association with Olympic Games is of more than eight decades. In 2005, the International Olympic Committee and Coca-Cola extended their agreement till 2020. 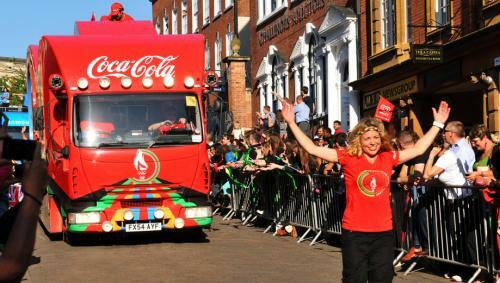 This year, Coca-Cola is the presenting partner of the Olympic flame. Around 2,000 representatives of the brand will take part in the Rio 2016 Olympic Torch Relay. The company will also create a “Coca-Cola Olympic Station” for teenagers in Rio at the Official Rio Live Site, Praca Maua. US-based Center for Science in the Public Interest criticised Coca-Cola’s partnership with the sporting event. “This kind of advertising seeks to achieve ‘innocence by association’—associating its products with the uplifting spirit of the Games and with athletic excellence,” said Michael F Jacobson, president of Center for Science in the Public Interest. In an attempt to counter Coca-Cola’s advertising, the advocacy group is circulating a video “Change the Tune” which reinterprets one of the brand’s popular commercials to highlight the health impacts of sugar-sweetened beverages. A study published in the journal Circulation attributed more than 180,000 global deaths in 2010 to the consumption of sugar-sweetened beverages. Around 72 per cent of these were from diabetes, 24.2 per cent from cardio-vascular diseases and 3.5 per cent from various cancers. “We can be sure that Coke’s sunny ads will mask the fact that sugar drinks are a major cause of obesity, type-2 diabetes, heart disease and other health problems,” added Jacobson. The Counter Olympics Network has also questioned the rationale behind junk food companies sponsoring the Olympics. In a sternly-worded message on Twitter, the network exclaimed, "That's got to be a joke hasn't it? Coca-Cola and McDonalds sponsoring a sports body promoting healthy lifestyles!" The Counter Olympics Network came together around the London 2012 Olympic Games. It links organisations and individuals critical of the sporting event.